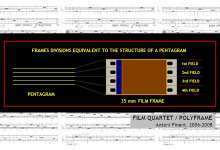 FILM QUARTET / POLYFRAME is conceived as a small cinematographic bomb attempting to question the established definition of frame as the minimum unit of (cinematographic) time by dynamiting it in four fragments. 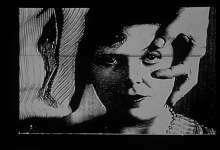 The appropriationism applied in this work makes use of material found in Hollywood cinema (SINGING’IN THE RAIN, 1952) ; the first avant-garde period (UN CHIEN ANDALOU, 1929) and American experimental film (WAVELENGTH, 1966-67). 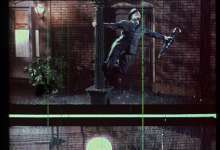 Such method makes possible, therefore, to maintain image ecology while it provides an analysis of the history of cinema. An explosive artifact has been inscribed as cinematographic notation on musical staffs. This piece celebrates the 50th anniversary of A MOVIE (1958), by Bruce Conner (1933-2008).